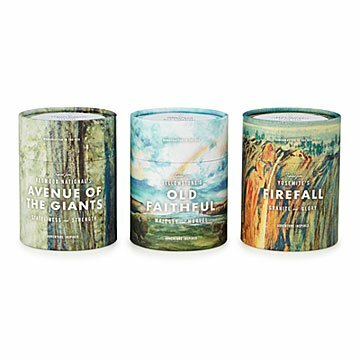 Laura Reid explored three national parks and crafted candles from their complex, iconic character. Each of our majestic national parks has its own sights, sounds... and scents. Laura Reid explored three parks and crafted candles from the complex character of their iconic features. The Avenue of the Giants from Redwood National Park is captured in notes of coastal redwood, bay laurel, and sea salt. The Old Faithful area of Yellowstone is portrayed with subalpine fir, thermal moss, and wild strawberry. The Yosemite Firefall phenomenon is reflected in brisk granite, fresh cedar, and black sage. Each of these layered bouquets is meticulously formulated through essential oils to bring a sense of scenic wonder and outdoor adventure to your home. Laura also commissions a local artist to create an original watercolor illustration for each of the national park areas featured, reproduced on the recyclable paper tube packaging. Hand poured using quality coconut wax, the candles make great gifts for nature lovers and aromatherapy aficionados. Glass and 100% recyclable packaging made in the USA; candles hand poured with lead-free cotton wicks in California. Laura Reid travels down every nature trail that inspires the scents she creates. She gathers as she goes—a bit of moss, a dollop of earth, maybe a leaf or a stone. Oftentimes, she returns to the area, vials in hand, just to make sure the scents truly remind her of the places she is so fond of, which include many of our beloved national parks. Laura uses local talent and resources for everything from the packaging to the artwork that graces each candle, which she hopes offers a scent-filled invitation into the quiet respite nature offers. 4" H x 3" dia. ; 10 oz. Never leave a burning candle unattended. Keep away from drafts, pets, and children. Only burn the candles on a level, fire-resistant surface. I love the scent of this candle so much I'll be buying one for myself. It truly does remind me of Avenue of the Giants. I hope it brings my friend closer to home each time he uses it. Wonderful smell. Great illustrations on outer container. My mom got this candle for me for my birthday this year. I took my honeymoon to the California coast, and we stopped at the Avenue of the Giants, so this candle was the perfect gift! Smells amazing and brings back lots of good memories! The candles bring back memories of my youth, camping in the Redwoods. The scent calms and relaxes me, bringing back some of my best memories. My aunt loved this gift. She just traveled to Yosemite for the first time, and plans to go to Yellowstone next. She is a casual hiker and big vacationer, so this was a perfect gift.